In last decade city is also known as the “World Capital Of Yoga and Meditation ”. Also considered as a paradise for spiritual seekers and dedicated students for yoga, meditation, and alternative healing. A peaceful city with many temples, ashrams on the banks of the holy Ganges River, Ever since the Beatles set foot on this holy land to meet, it became famous instantly with thousands of international travelers visiting here every year to practice yoga, learn meditation and gain spiritual knowledge about Hindu culture. Rishikesh is also known Gateway to the Himalayas. And the beginning point for The Char Dham Yatra (Four Shrines Sacred Journey). Having a magical breeze blowing through the valley carrying the beautiful smell of burning incense from the morning & evening aarti(prayers) performed on the river banks. The gentle flow of holy river Ganges with many temples bells ringing and a breathtaking sunset behind the mighty Himalayas makes the mesmerizing atmosphere. Ram Jhula is an iron suspension bridge situated in the heart of the city. Which was built in the year 1986, surrounded by 13-story temples which called as Tera-Manzil temple, near the bridge there bustling Indian market, traditional ashrams, yoga meditations schools, budget guest houses, national & international friendly multi cuisine vegetarian restaurants. 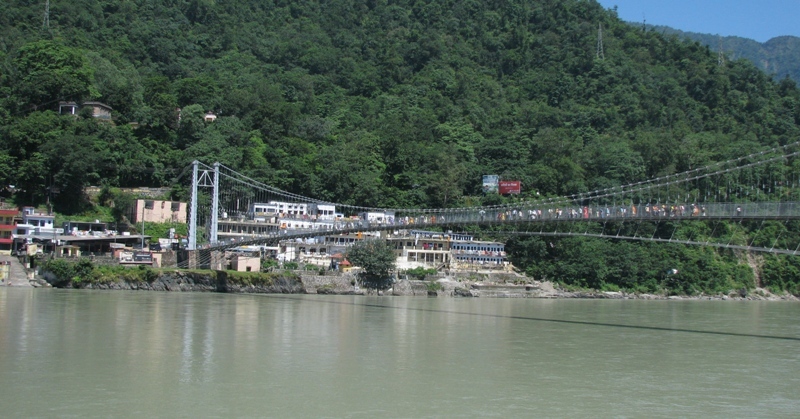 Laxman Jhula is one of the main landmarks of Rishikesh City too. Another Bridge Ram Jhula which was built in the 1980s to cross the Ganges River, distance between ram jhula and Laxman jhula is around 3 kilometers. While these two bridges are nearly identical in appearance and design, the Ram Jhula is a bit bigger. Between this two bridges, there are a lot of ashrams and religious centers like Gita Bhawan, Swargashram, Balyogi Prem Verni Ashram, Parmarth Niketan Ashram and Sivananda Ashram. 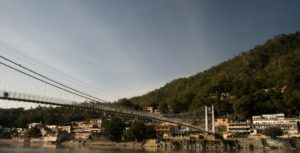 While Rishikesh city itself is quite large, still most pilgrims and international travelers only stay in a small area situated between Ram Jhula and Lakshman Jhula. Parmarth Niketan Ashram Near Ram Jhula is one of the few Ashrams in India where Kids get the ancient Vedic education. Parmarth Niketan Ashram is highly recommended the place to visit especially in evening time for the Ganga Pooja/Aarti. Starts at 5 PM in Winter and 6 PM in summer. Maharishi Mahesh Yogi’s ashram also called as (Beatles ashram) this is the place Where the fab four practiced transcendental meditation(TM) and wrote many songs from the White Album. Ashram is a few kms from the Laxman Jhula. Rishikesh city is very close Dehradun’s Jolly Grant Airport, also known as Dehradun Airport, located at 1805 feet above sea level. Jolly Grant Airport is located 30 kilometers towards east from the Dehradun city. Dehradun’s Jolly Grant Airport has only one Terminal(1) for all the domestic flights. There are many flights available daily to different parts of the country mainly connecting flights through New Delhi. 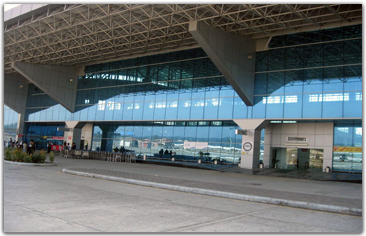 Domestic airlines companies like Jet Airways, Indian Airlines, and Spicejet operate at the Jolly Grant Airport. Dehradun’s Jolly Grant Airport is 20 km (12 miles) from Rishikesh city, and 30 km (19 miles) from Haridwar city, by Car taxi it takes approximately a 30 minutes drive to Rishikesh and 45 minutes to Haridwar. Best time to visit Rishikesh for River Rafting? The best time to visit Rishikesh for River Rafting activities is from September – October to November. Most nice clean & cheap accommodation and restaurants can be found near Ram Jhula, Lakshman Jhula, and Swarg Ashram. How to Reach Rishikesh From New Delhi airport. The distance between New Delhi and Rishikesh is around 230 km. New Delhi airport to Rishikesh by car taxi is a good option for a hassle free traveling specially for international tourists who are traveling to India for the first time. It’s a 7 to 8 hours journey. Taxi Prices vary from US$ 80 for an air conditioned compact car taxi to US$ 125 for an air conditioned SUV. These days you can get shared taxi service from companies like Ola Cabs, getmecab or even for MakeMyTrip as well. Know what is the best time and season to visit Rishikesh for international tourist. Although Rishikesh climate is favorable throughout the year, here is a months breakup of Rishikesh’s climatic conditions you give you better understanding? Best time to visit Rishikesh is from September to May month. September to October end is beginning of the peak season for international tourist. November until mid-December is High Peak Season time for international tourist. Mid December Till mid-February is big cold in Rishikesh it’s again peak season for international tourist. Mid-February until April is again High Peak Season as its time when Prem Baba, Shri Mooji, and many other spiritual masters are giving Satsang in Rishikesh. In Rishikesh, generally summers are quite hot and dry. Summer starts from May and ends in mid-July, the temperature remains between 30-40 °C. Mountaineering, trekking, camping and river rafting activities are in full swing in the summers in Rishikesh. The minimum temperature can drop to 290 C. Rishikesh is usually empty especially international tourist start to leave this time. During summer days there can be occasional rain which further increases humidity in the air. It is suggested wearing cotton clothes in summer in Rishikesh. The monsoon season which brings continuous rain In Rishikesh starts during July, till mid-September. While the maximum temperature during day time this period is 27.0 C, the minimum temperature is around 19.0 C. regular rainfall during the daytime makes it hard for any tourist activity like sightseeing. The average rainfall recorded during monsoon time in Rishikesh is around 2136.7 mm. Winters season starts from mid-November till February end in Rishikesh. It’s cold, still not extremely cold. During winter the temperature remains below 20°C, sometimes it touches the freezing point. Wollen clothing is essential during this period. Haridwar City – distance between Haridwar & Rishikesh is approximate 25 km. You can take car taxi or Auto rickshaw/Tempo service which runs throughout the day between 2 cities. Amritsar City – The distance between Amritsar to Rishikesh is 427 km by Road. You can reach Amritsar by an overnight train or day train from neighboring Haridwar railway station which is approximate 25 km from Rishikesh. Mcleodganj Upper Dharamshala City – The driving distance between Rishikesh and Mcleodganj Dharamshala is approximate 449 km, overnight bus service can reach it with around 12 hours journey. There is no direct train between Rishikesh and Dharamsala. You can take Hemkunt Exp from Haridwar railway station to Pathankot then from there you can take the local bus or private car taxi from Pathankot to Dharamsala. Manali city – The driving distance between Rishikesh and Manali is approximate 488 km, There is no direct bus service between Rishikesh and Manali. First, You can take a bus or car taxi service from Rishikesh to Dehradun, then from there you can take State Transport Bus from Dehradun to Manali. Badrinath Holy City – The driving distance between Rishikesh and Badrinath is approximate 298 km, There is only 1 direct bus between Rishikesh to Badrinath, it’s better to get a private taxi to visit Badrinath. Between Ram & Laxman Jhula there are many travel agents you provide complete service to Badrinath travel.